When I professionally stage an empty home for sale, I have my clients rent contemporary furnishings because they give a breath of fresh air to even the most dated homes and the updated look appeals to most buyers. Light cream cotton sofas, perfectly placed silk pillows, cashmere throws & glass tables are a constant in staging design to make a place feel bright, spacious and beautiful. But it is a difficult look to maintain if you actually live there! 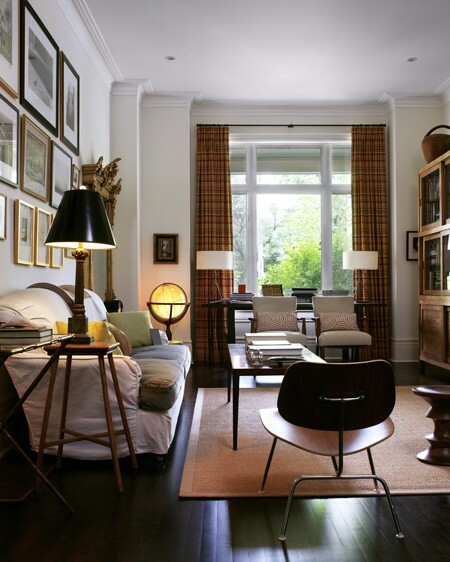 For real everyday living, I prefer a design style that is more of an eclectic mix… old pieces with the new. The overall look is still contemporary, but more forgiving and relaxed. I like durable surfaces that hold up to realities of family life. Rustic wood tops (no coasters! ), upholstered pieces in microfiber (super easy to clean spills), and washable slipcovers are all good when you are creating a realistic environment that works with children & pets. You don’t have to give up good design for comfort and function. I also like to work with a neutral color palette. Too many strong colors and patterns are not relaxing, and most people like a calm home to retreat to. You can still achieve interesting variation through lots of tones and textures. Currently, I am using the “new neutrals” as alternatives to beige: warm grays, taupe & sage. They are subtle hues and keep the look light, while retaining the cozy. Pair them with a chunky knitted throw and a pouf and you are ready for the winter months ahead. And don’t forget the occasional small pop of color to add life. This design look isn’t fussy, but it isn’t slouchy either. The look is pared down, but far from minimal or sparse…I would call it “balanced”. Simple, functional elements for real life.